There are so many great recipes in this issue, I hardly knew which to select to make. There is a long article on “A Taste of Haiti,” with recipes for Haitian dinner parties. It includes rum in both cocktails and a fruit punch, a couple pork recipes, rice and beans, fried plantains, sweet potato pudding, red snapper with avocado sauce, a hearts of palm salad, curried eggplant, a chicken dish also with rum, Creole rice, shrimp with a lime-garlic sauce, and a tropical fruit dessert with papayas, bananas, oranges, and coconut. It’s followed by articles on making a variety of pilafs, 60-minute meals, and a hearty Irish stew. But the recipe I decided to make turned out to be perfect for the cold and snowy days of the Chicago area. It’s a refrigerated bread dough that doesn’t even have to be kneaded, and can be shaped into five different shapes. The dough goes together quickly, then covered and refrigerated overnight. The timing was perfect because when I woke up the next morning, it was already snowing which made it the perfect day to stay in and bake bread. The kitchen aroma made the whole house a pleasure to be inside. 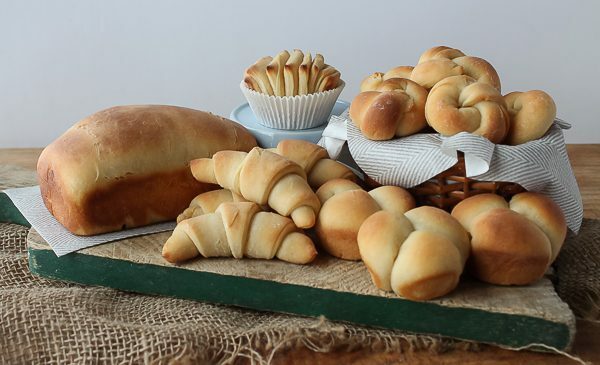 First I made all the different shapes, which are cloverleaf rolls, crescents, rosettes, Fan Tans, and a mini loaf. Everything is brushed with butter before and after baking. Here is every shape after baking and ready to eat! They all turned out so beautiful and tasted wonderful! My favorite was the crescents, and my daughter Kristina (who was here visiting for a week!) favored the adorable Fan Tans. Here’s something to remember if you make the Fan Tans. They bake perfectly but will fall apart into each little slice if you don’t place them in muffin paper cups right after baking. I didn’t bake them in the muffins cups, just used them to hold together after baking. It was a cute way to serve them too. I had such fun making all the shapes and will definitely be making them again. What a great way to spend a cold winter’s day, don’t you think? Dissolve yeast in warm water in large mixer bowl. Add sugar, shortening, salt, egg, milk solids, and 3 cups of the flour. Beat on low speed until ingredients are moistened. Beat on medium speed until mixture is smooth, about 1 minute. Stir in enough flour (start with 2-1/2 cups) to make dough easy to handle. Place in greased bowl. Turn greased side up and cover with plastic wrap. Refrigerate at least 8 hours or overnight. Shape dough into rolls of desired shapes or loaves (see variations below). Brush with melted butter. Let rise in warm place until double, 1-1/2 to 2 hours. Heat oven to 375 degrees. 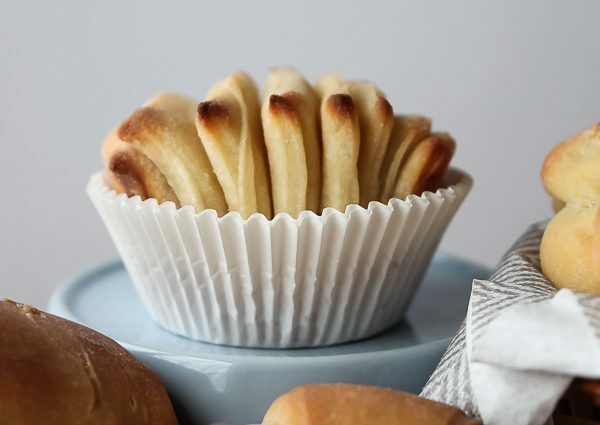 Bake rolls until golden, about 12 minutes. Bake loaves until golden, about 20 minutes. Remove from oven and brush again with melted butter. Remove to wire racks to cool. CLOVERLEAF ROLLS: Roll out ⅕ of dough on lightly floured board into a rectangle, 12-by-9-inches. Cut into 18 smaller rectangles, 3-by-2-inches each. Form rectangles into balls. Place 3 balls in each greased muffin cup. Makes 6 cloverleaf rolls. CRESCENTS: Roll out ⅕ of dough on lightly floured board into 11-inch circle. Brush with melted butter. Cut into 12 wedges. Roll wedges from wide to end to form crescents. Place point side down on greased baking sheets, or lined with parchment. 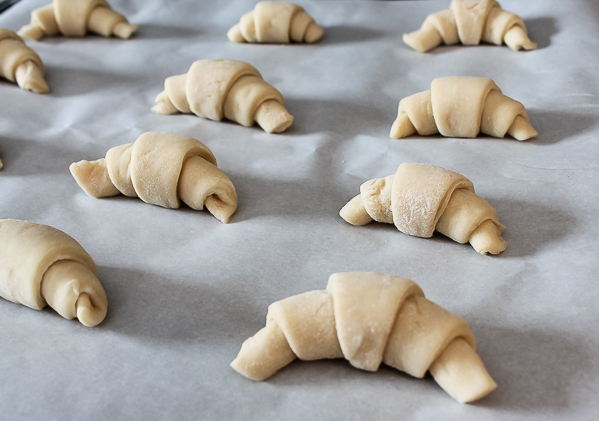 Makes 12 crescents. 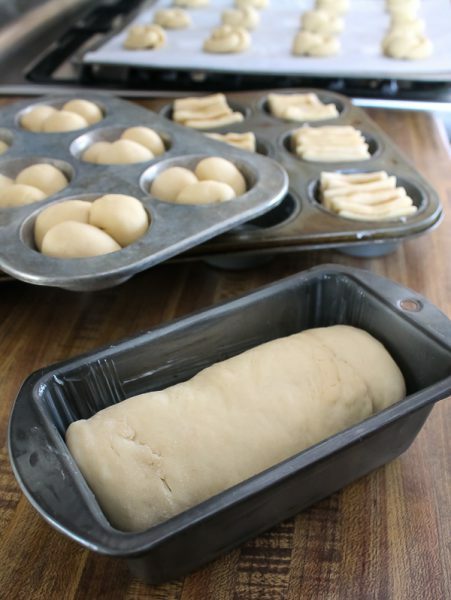 LOAF: Shape ⅕ of dough into loaf shape to fit a greased mini loaf pan. Brush with melted butter. Makes 1 loaf. ROSETTES: Roll ⅕ of dough on lightly floured board into rectangle, 12-by-9-inches. Cut into 12 smaller rectangles, 4-1/2-by-2-inches. Roll each rectangle to form a rope 8 to 9 inches long. Tie rope into a single knot. Bring ends to center. Place on greased baking sheet or line with parchment. Brush with melted butter. Makes 12 rosettes. FAN TANS: Roll ⅕ of dough on lightly floured board into rectangle, 12-by-9-inches. Brush with melted butter. Cut into 18 smaller rectangles 3-by-2-inches each. Stack 2 rectangles, one on top of another. Cut crosswise in half. Place halves together in greased muffin cups, cut side up. Repeat with remaining rectangles. Makes 9 Fan Tans. 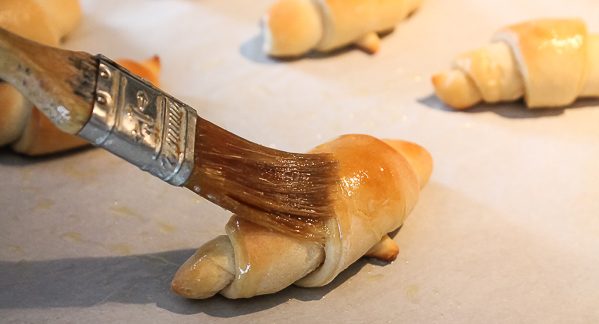 NOTE: For each shape, brush all again right after baking with melted butter. I also made bread last week–it was originally a Tupperware recipe that was for their bread proofing bowl–you put the dough in the bowl and “burp” the cover. When the seal pops off the dough is ready for it’s first knead. You then add butter and do it again. It’s supposed to be made into loaves, but I made it into rolls in a cake pan so they become pull-apart rolls. I don’t have the Tupperware bread proofing bowl so I had to judge when I thought it had risen enough. The recipe is much like yours above as mine used milk also–but scalded. If you want to check out the recipe search for Tupperware Bread or Tupper Bread. 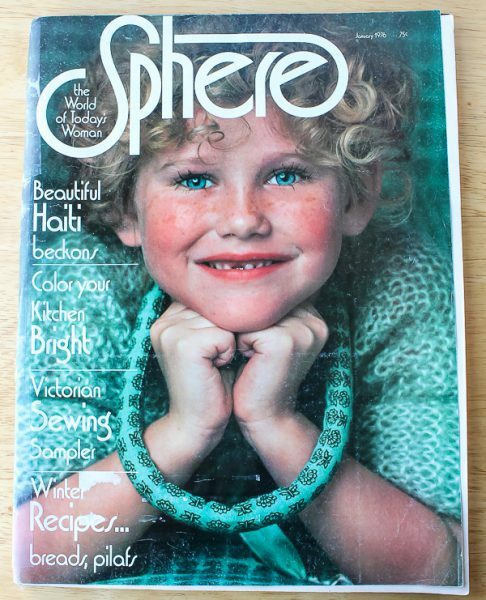 I remember that bowl! I have some really old Tupperware, but not that one. It certainly is homemade bread season, isn’t it? Sounds like you and Kristina know how to enjoy a snowy day. Baking in the kitchen! Perfect! There is nothing like the smell of fresh baked bread or the taste of fresh buttered bread out of the oven. It would be fun to be snowed in with you! There’s nothing like being in the kitchen on a snowy day! Thank you for sharing this recipe! It sounds delightful! Thanks, Ronna! Hope you enjoy the bread.